Data-Sora battling Heartless in a Bugged Area. System Sectors are locations unique to Kingdom Hearts Re:coded, replacing the Debug Areas that appeared in Kingdom Hearts coded. They can be accesed through Backdoors, and are found in every world. A System Sector can have several different floors. Once one floor is cleared, a link appears, which allows Data-Sora to move up a floor. Eventually, a terminal will open, allowing Sora to leave the System Sector altogether. Inside each Sector reside bugs. If a section of the Sector is colored red, bugged enemies must be eliminated. Once Data-Sora has defeated every bugged Heartless, the room will become blue. The link to move up a floor or terminal to leave the System Sector only appears after every room is blue, known as a 'Sector Debug'. Defeating Heartless and destroying Bug Blox will earn Data-Sora System Points, or SP. Once Data-Sora leaves the Sector, he will be prompted to redeem his SP for rewards. The first few rewards will be highlighted in yellow, meaning that they are "system rewards", and that they can only be redeemed once. Below these are other prizes, which can be obtained repeatedly. Once the player doesn't have enough SP for an item, they must trade the remainder in for equivalent EXP or munny, which is capped at 99999 EXP or munny. After completing Traverse Town, System Challenges become available. Once Data-Sora enters a System Sector, he will be rewarded 1000 SP. Before he can enter each floor, he will be prompted to wager 10%, 30%, or 50% of the SP he had when entering the floor. If he can complete the challenge, he will be rewarded the amount wagered, with a multiplier added. If he loses the challenge, he will lose the amount of SP wagered. If the player runs out of HP during a challenge, they lose a large majority of their SP. Each floor has a separate challenge. 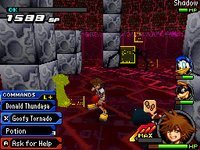 Later in the game, floors may be randomly infected by a virus, forcing Data-Sora to wager all of his SP on its challenge, and causing each room to be not only bugged, but have stronger Heartless. Data-Sora finds a Backdoor, an entrance to a System Sector. Each System Sector requires Data-Sora to find a Backdoor, which is invisible, so that he can access the System Sector. While finding a Backdoor, a beeping is heard and a blue sensor appears on the bottom screen, mini-map, around the icon representing Data-Sora. Finding a Backdoor is similar to playing a game of "Hunt the Thimble" as the player must search for the invisible door with the aid of the beeping, which beeps faster when Data-Sora goes closer to the Backdoor, and the sensor, which flashes faster and becomes red when Data-Sora gets closer. When Data-Sora is very close to the Backdoor, the invisible door is locked on and the player must examine it to open the door, making it visible. Leveling up Scan allows Data-Sora to detect more Backdoors and System Sectors.